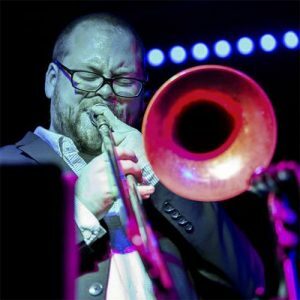 As part of a weekend in Ohio to spread the word of his new album, Columbus native and trombonist Sam Blakeslee will lead a quintet at Filament at the Vanderelli Room on Sunday, November 4th from 8 to 11pm. There is a $10 suggested donation for admission. This string of dates celebrates the release of the Sam Blakeslee Large Group album Live at Blu Jazz, which will be released on October 25th and is available for pre-order here. Bandcamp download cards will be for sale at the concert for Live at Blu Jazz for $10, and $15 will get you both the latest release as well as his 2017 debut Selective Coverage. For the Filament concert, Blakeslee will be joined by Brandon Coleman on guitar, Ben Tweedt on piano, Matt Wiles on bass, and Jeff Mellott on drums. Blakeslee was kind enough to answer my questions via email about the concert, the album, and current projects, so keep reading to learn more and prepare for an exciting night of live jazz! What can potential attendees expect to hear at this concert? Sam Blakeslee (SB): For this concert it will be a mash-up of repertoire from my first record with my quintet Selective Coverage, some newer quintet material, as well as some paired down arrangements of tracks from the upcoming Large Group album Live at Blu Jazz. It’s always a fun undertaking perform chamber arrangements of big band pieces or to expand music into large ensembles that was originally written for small groups. The music on the Live at Blu Jazz album was recorded as early as January 2016, so it’s almost like a time capsule to go back and perform some of those compositions. It’s always refreshing to come back to something as an improviser after some time away from it. I see that your band for the Columbus show entails some great Cincinnati musicians. How did this lineup come together, and what are you anticipating that this band will contribute to your compositions? SB: One of the things that I’m most glad about in my time in Ohio was that I was able to connect with guitarist Brandon Coleman and through him bassist Matt Wiles, drummer Jeff Mellott, and pianist Ben Tweedt. They are incredible versatile musicians, feeling very comfortable in straight-ahead, free, and fusion styles. Since I’ve had the quintet together for almost 3 years now, the music has become pretty diverse from a style standpoint as my approach changes from time to time, so it’s important for me to try to find people that can go from one vibe to another without it feeling forced. While they are all amazing instrumentalists and improvisers, the main thing I like playing with them is that on each tune there is a massive emphasis on listening and group communication. It’s fun for me because a lot of the quintet tunes I’ve played with the same band that was on the first album, so I always appreciate curveballs that get thrown into the mix to keep me on my toes. They are always able to take the song in a different direction than I would have thought, but not sacrificing the intent of the composition, so it’s always incredibly refreshing and fulfilling. I was very excited to hear about Live at Blu Jazz. These tracks were recorded live over the course of the residency, correct? How did you choose the album tunes from what I assume was a wealth of material? SB: Yes, the tracks on the album range from January 2016-2017, while the residency lasted until July 2017. I think one of the reasons it took me so long to put out is how much recorded material I had to pick from! By the time it was done, I think there was around 180 tracks or so. The nice thing about it was that often times I had numerous takes of the same composition, so I could really pick and choose the best performances. The other thing that I wanted to insure was that the tracks included the personnel of the group that really made it special and unique. I’m so glad to be able to release this and document the collaboration with musicians and friends like Chris Coles, Nathan Davis, Bobby Selvaggio, Jack Schantz, Theron Brown, Brad Wagner, Dave Morgan, and Dustin May, as well as some special guest appearances from Dan Wilson and Kip Reed. All of the musicians listed above were have either been great friends for 10+ years or were huge mentors to me, so it was really important to make sure they were well represented on the album. It was actually really hard to limit the album to only 9 tracks, but I think the tracks that were selected definitely paint a picture of what each first Thursday of the month was at Blu Jazz. We’ve talked about your method of combining personal storytelling with social commentary. Were those objectives in play on this album’s material? Do you have any stories about the background of any particular tunes? SB: While there are definitely some stories behind the individual compositions, it doesn’t carry the same chronological weight that Selective Coverage did. My main goal was to try to pick the best takes to depict the force of energy that took the stage at Blu every month. However, the first track of the album “New Blood” was the first composition I wrote for the group in 2014. At the time I was really hungry to play some more contemporary large ensemble music in Cleveland and that song was celebrating the start of the new group as well as all the amazing young musicians who decided to stick around the area after finishing their degrees. The second track, “One More Conversation” I think holds the most personal importance to me. The concept behind the tune is being able to have just one more conversation with someone important in your life who had passed on. Throughout writing the piece, I thought a lot about my grandparents Chuck and Betty Letson and Jim Blakeslee who are no longer with us. It took me through all these different stages of grief, times of feeling the mixture of being lost without them and grateful for the time we did have. It’s one of the longer tracks on the album and I think it really lets you slip into that space to contemplate. I know your Blu residency was a major undertaking, but also seems to have been very rewarding. How did the residency shape your approach to your music and influence your composing and arranging going forward? SB: Running a big band definitely has its challenges in the preparation, but in the performances it is incredibly rewarding. The residency was a godsend for my composing and arranging. It gave me an infrastructure to consistently write new things to keep the shows fresh and interesting for both the band and the audience. Through that process it allowed me to fine tune aspects of form and orchestration which I felt were definite weak points before it started in January 2016. It also reaffirmed that I really like to bounce from style to style and not feel pigeon-holed into one approach. Towards the end of the residency we did some tribute shows to Duke Ellington, Thad Jones, and we did an all standards show of arrangements of mine. I definitely took that approach with me into my move into NYC where I seem to be playing a different style of jazz or commercial music every day. The residency made me realize that is perfectly fine as a musician, as opposed to other viewpoints where you have to kind of pick one and stick with it. Any new projects in the works, or interesting bands that you’re playing with in NYC? SB: I’m starting to get the Large Group going here in NYC, which I’m really excited about. Right now we have the album release show on 10/25/18 at ShapeShifter Lab in Brooklyn and on 11/19 I’m happy to have the group be performing at the Living Large Concert Series curated by Josh Shneider at Slope Lounge, also in Brooklyn. I’ve been throwing my name in the ring for some grants to hopefully make a studio recording with the Large Group happen with new music I’ve been writing, but if that doesn’t work out I’m hoping to document the next quintet album in the next year or so. I’ve been very fortunate to play with some great groups here in NYC. I’ve been keeping busy with a lot of groups, but I seem working a lot with the Dan Pugach Nonet, the Latin Grammy-winning Afro Bop Alliance, and the New Alchemy Jazz Orchestra. It’s been a lot of fun to get deeper in the trombone sub scene in the big band scene in NYC because often times even if I’m not on a certain gig I still get to bump shoulders with a lot of my heroes in the rehearsals, which both pushes my abilities as well being very fulfilling.